Butcher paper is the type of paper traditionally used by butchers to wrap meat and fish, while kraft paper, in brown or white, has a range of uses from industrial shipping to packaging. Both of these paper types actually have a wide variety of uses outside of your local butcher shop or manufacturing facility. In many restaurants, Kraft paper and Butcher paper have starring roles, not only as a tray liner but as a tabletop cover too. Paper tablecloths are not just for casual picnic-style joints, but are proving to be an effective alternative to linens at even the finest of establishments. Taking It a step further, diners and uber-chic cafes and bistros alike are taking advantage of custom printing options on kraft and butcher paper, creating a unique and even artistic vibe that matches their restaurant’s personality. Creative. Who wants a plain white tabletop? So, what do you want your tables to “say”? 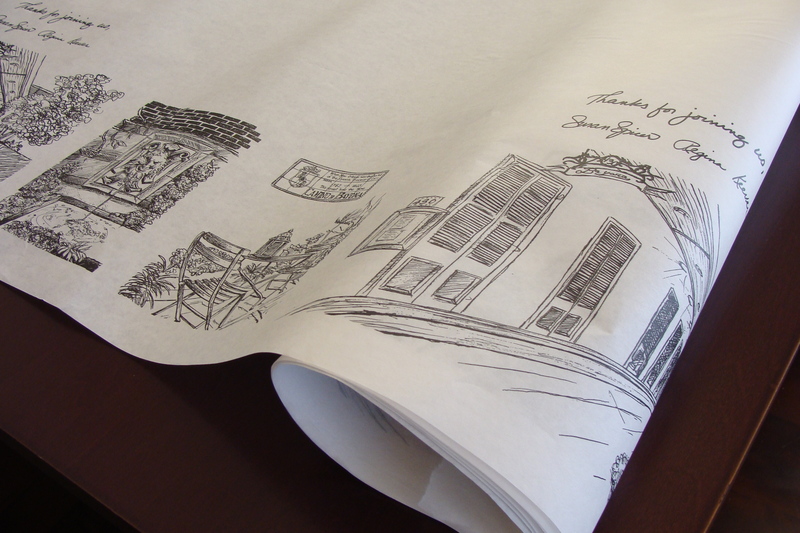 At Bayona in New Orleans, their butcher paper tabletops are customized with beautiful sketches of the lovely historic building which houses their famous restaurant. These printed paper works of art are so well received that customers have been asking to buy them! At Crabs in south Florida, diagrams and directions for “how to eat a crab” are cleverly printed on each table covering, adding both a practical yet whimsical flair. Fine dining establishments have been known to print wine pairing suggestions for their discerning clientele. More casual cafes and bistros have helpful and fun facts about the area, tourist tips and even maps with places of interest. At Oren, we can custom print your logo and artwork on rolls; but for a cleaner look (no tear marks from ripping off the roll), and to create less waste, we recommend custom cut sheets in standard sizes that fit most restaurant tables. Our four standard cuts are 30 x 30, 30 x 48, 36 x 36 and 30 x 64. What are your tabletops saying about your establishment? Our paper converting company can help create your restaurant’s own unique identity…one butcher paper tabletop at a time.